In the afternoon, we’ll embark on a tour of the "White City" starting with the most popular sites: the Central Post Office, the Cathedral, and the War Museum. The tour ends with a visit of the China Town, which is an interesting place to see classical Chinese architecture reminiscent of years gone by with plenty of Chinese restaurants. Day 12: Siem Reap - Angkor Thom - Angkor Wat – Siem Reap. Day 13: Siem Reap - Banteay Srei - Banteay Srame - Pre Rup - Siem Reap. Day 01: Arrive in Hanoi. You will arrive in Hanoi’s Noi Bai International Airport and meet your tour guide, then board a transfer into the city center and check in to your hotel. Feel free to spend your first day relaxing or exploring everything Vietnam’s capital has to offer. Your first night on this tour will be spent in the hotel. The secondday will begin with an excursion through the capital of Vietnam with the most popular sites: the Temple of Literature dedicated to Confucianism (which was built in 1070 and , became the first Royal National University of Vietnam in 1076) and, the mausoleum of Ho Chi Minh (closed every Monday and Friday). In the afternoon, we will visit the Ethnographic Museum (closed every Monday) and at the end of the afternoon, we will take a tour around Hoan Kiem Lake and the city’s famous Old Quarteri. 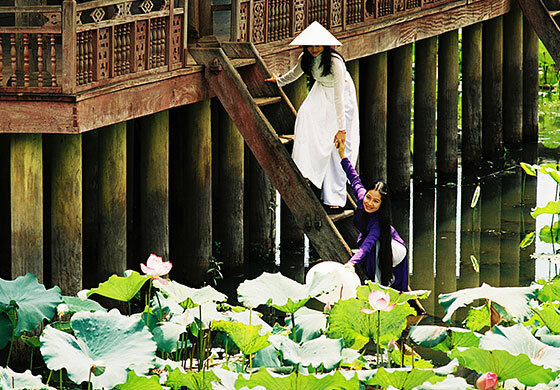 In the evening you can relax with a water puppet show, spending the second night in the hotel in Hanoi. In the early morning, we’ll head out to Halong (Ha Long Bay).On the way, you will have the opportunity to admire beautiful views of the countryside. 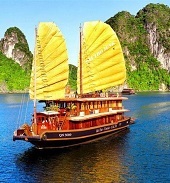 We will arrive at Ha Long Bay in the late morning and embarking on a “junk boat”(an ancient Chinese sailing ship) for a cruise in the Halong Bay. We’ll visit the caves and the isle with a sampan or kayak. Enjoy a lunch and dinner of delicious seafood on the junk boat. Our fifth night will be spend on board in your own private cabin. In the morning afterbreakfast, we will leave the junk and begin our trip through the Cave of Surprises with a sampan. 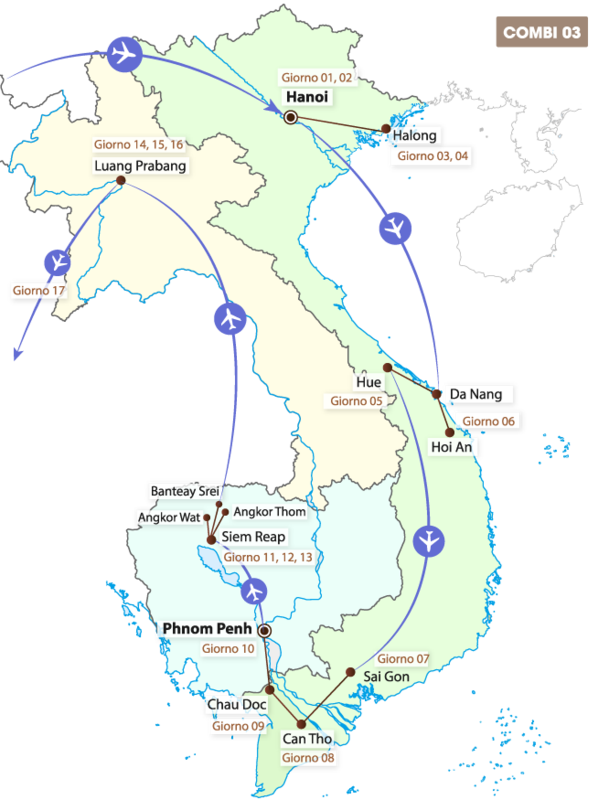 In the afternoon, we’ll transfer to Hanoi’s airport for a flight to the city of Danang. Once there, we will transfer to Hoi An and check into our hotel, spending the night in Hoi An. After breakfast, we’ll depart on our tour throught the ancient town to see the: Pagoda Chuc Thanh ( the oldest pagoda in Hoi An, built by a Chinese monaco in 1454). The visit continues with the Japanese Bridge, the Chinese Temple, the Phung Hung House and the surrounding villages, visiting the markets and the port. 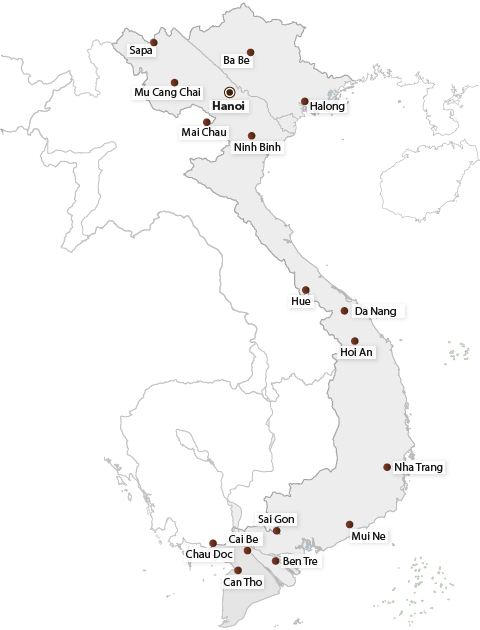 After lunch, we’ll depart for Da Nang via the famous "Hai Van Pass", which offers a wonderful view of the coastline. Tonight will be spent at our hotel in Hue. 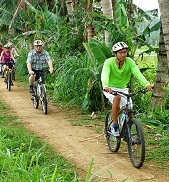 In the morning, we’ll depart for the village of Thuy Bieu where you can participate in a cooking class, then embark on a leisurely biking tour into the village where you can discover the daily activities of the locals. Later in the day you’ll have a little rest with a nice foot massage using hot water and medicinal plants, a traditional therapeutic practice only for the travellers and locals alike. After breakfast, we’ll transfer to Hue’s local airport for our flight to Saigon (Ho Chi Minh City). Once arriving, we’ll transfer into the city center and check in at the hotel. After breakfast, we will depart for Ben Tre - the “coconut capital” in Vietnam. Arriving at the pier of Hung Vuong. 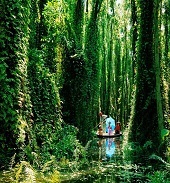 A short transfer by boat takes us into the small canals. During the tour we will have the opportunity to admire the vibrant local activities from, fishing along the river to experiencing life on channels. We will then visit a local coconut candy factory of coconut candy, followed by a top at the furnace of Mr. Tu Lo to observe the procession of the bricks in the traditional style. A short trip in a rowing boat takes take us to a small local restaurant for lunch. Following lunch, we’ll have time for a bit of relaxation and then a nice bike ride through lush gardens, rice fields, and channels. 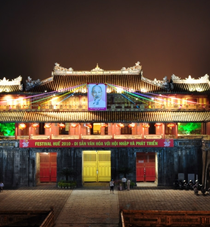 We’ll get to visit to the ancient house of Mr. Sau Khanh to admire its splendid collection of antique porcelain. 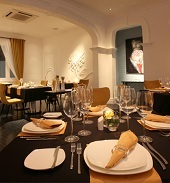 Dinner will be servedat a local restaurant with typical Vietnamese cuisine. After dinner we will drive to Can Tho to spend the night in our hotel. Early in the morning, you’ll get to take a boat tour to the floating market of Cai Rang to be greeted by the most beautiful scene: hundreds of boats are full of rice, fruits, and handicrafts gathered together by local merchants to sell exchange or sell their wares. Here in this market we can discover the daily life of the inhabitants and their animated activities. We will also have the opportunity to taste fresh fruit cultivated on site. Later, we’ll get to visit the Binh Thuy ancient house where the Academy Award-winning 1992 movie"The Lover" was filmed, and then a stop at the Khmer pagoda. Once finished, we will depart for Can Tho and head back to Chau Doc. 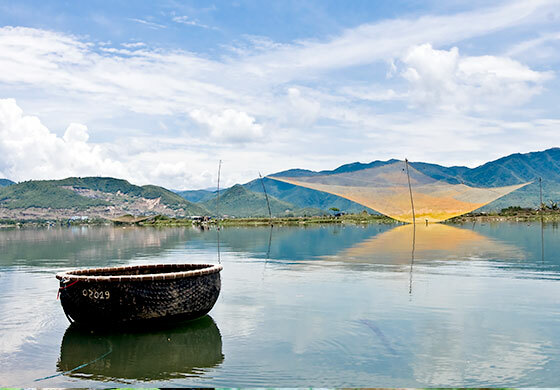 Once arrive in Chau Doc, we check into the hotel and begin a boat trip to discover the floating fish farms. We'll spend the ninth night in Chau Doc. After breakfast, we’ll transfer to the pier to check into the junk boat and head for Phnom Penh. Make sure you’ve got your passport easily accessible, as we’ll go through the typical i Immigration procedures at the border. Once through, we’ll continue to sail to Phnom Penh. Once comfortable, we’ll begin the city tours with the Royal Palace (including the Silver Pagoda which was built in 1866 during the French protectorate of King Norodom), the National Museum,(built by King Sisowath in 1920), as well as the pagoda of Wat Phnom, which is, located on a hill offering a panoramic view of the city. We’ll then walk to the Tuol Tumpoung market (also called the Russian market), a great place to buy antiques and fabrics. Our first night will be spent in a hotel in Phnom Penh. In the morning, we depart for airport to catch the flight to. Phnom Penh. Once arrive, we’ll visit the archaeological site of Hariharalaya, the pre-Angkorian city that was built in the ninth-century. In this place, now known as Rolous, we can admire temples built with more rudimentary and primitive techniques compared to Angkor, but equally full of charm. In the ninth century, sandstone was not used in construction, and thus the Preah Ko temple and Lolei towers were built entirely of brick. We’ll visit the main attractions of the Rolous group: the mammoth Bakong, a "mountain temple" which is similar to a pyramid with five level stands and a wide canal that surrounds the center. We begin the trip with a visit on tuk tuk to the city of Angkor Thom, the South Gate, the spectacular temple of Bayon, with more than two hundred enigmatic faces, the temple of the Leper King and the snake, and; Pimeanakas, the area where it was located within the Royal Palace. We also visit the most beautiful temple of "Small Circuit": Ta Prohm, which is very popular with scenes from the movie Tomb Raider. In the afternoon, we’ll begin to the visit of Angkor Wat, the most famous and largest religious complex in the world. We’ll spend the night back at our hotel in Siem Reap. We’ll spend the night with a dinner at a restaurant with a show of Apsara dances and back at our hotel in Siem Reap. We’ll depart for Banteay Srei (Citadel of Women), dedicated to Shiva, whose architecture and pink sculptures are a masterpiece of Khmer art. Then, we continue the trip at splendid Banteay Samre temple. 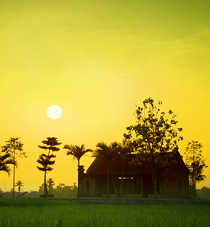 In the afternoon, we'll go to visit a palm sugar village, where the best kind of sugar is made of thnot water. After all, we'll go to visit the Pre Rup temple, the most beautiful one in Grand Circuit. After breakfast at the hotel, we’ll take cruise on Tonle Sap Lake to visit the Kampong Pluck village. 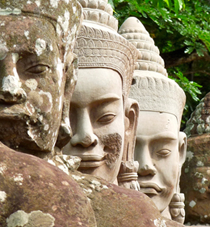 We’ll take some time to visit the Artisan d'Angkor art school. Then, we'll go shopping at Phsar Chas market where you can find the high quality souvenir such as silk, jewelry, and so much more. In the afternoon, we transfer to the airport for our flight to Luang Prabang. Once arrive, you'll have a chace to visit the night bazar. In early morning, we’ll take part in the Tak Bat (where monks go around the city to collect food). It’s an ancient Buddhist ritual that still happens in the city of Luang Prabang. Before returning to the hotel for breakfast, you can have the opportunity to visit a local market. After breakfast, we’ll start with a visit to the Royal Palace Museum where and you can see a large number of interesting craft items. Afterwards we will visit the magnificent Wat Xieng Thong with a detailed roof and stands as an example of classical Laotian architecture. We also will visit the beautiful Wat Mai and stupa of Wat Visoun. After that we will visit the Arts and Ethnology Centre to better understand the tradition and customs of the ethnic minorities live in Laos. In the afternoon, we’ll visit the villages of an Xangkhong & Ban Xienglek, which is famous for their excellent textile works. The last visit of the day is a climb to the top of Mount Phousi for an enjoyable exploration of the golden stupa and to enjoy a beautiful view of the city and the Mekong at sunset at Wat Phabat Tai. We’ll go on a cruise up through the Mekong River, which will give us a panoramic view of the tranquil countryside. Our first stop is the village of Ban Muang Keo, where we’ll start a short trek to reach the mysterious caves of Pak Ou, two caves set in a limestone cliff in front of the Mekong River. Pak Ou is crammed with thousands of Buddha statues in various shapes and sizes. We then return to Luang Prabang by boat, stopping at Bang Nongxai which is very popular with craft. we’ll drive to the beautiful Kuang Si Waterfall, where you can cool off with a refreshing swim in the turquoise pool or walk along the forest paths. Next to the falls is a Bear Rescue Centre, which does a wonderful job of protecting and restoring the rare Asiatic Black Bear. We’ll arrive back at Luang Prabang in time for dinner. After breakfast, we transfer to the airport for our outbound flight.